Vinci - a commune in Florence Province, Tuscany. Celebrating the April 15 birthday of the great Leonardo, New Milford, CT (USA), sister-city-in-the-making of the Comune di Vinci, Italy, (website <www.comune.vinci.fi.it> ) is flying the one-year-old Vinci flag. 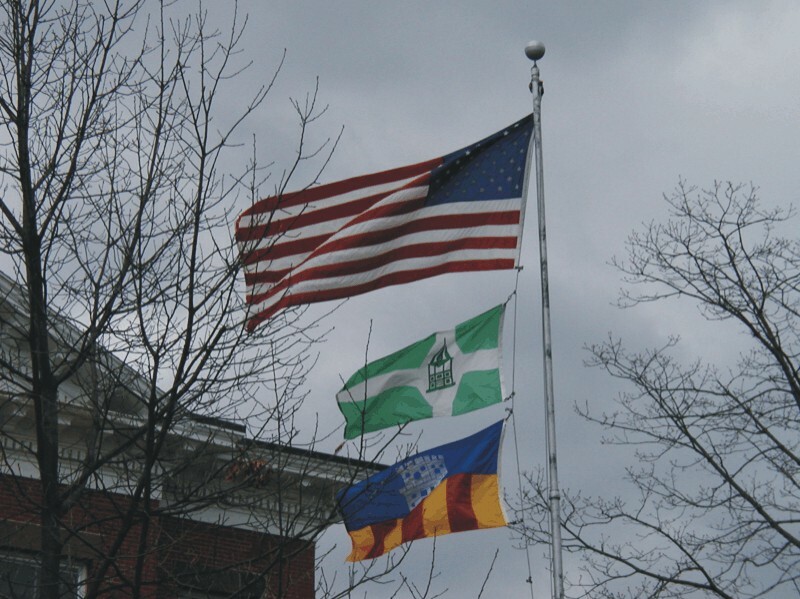 Here's a photo of a unique flag combination -USA-New Milford-Vinci flying from the flag pole in front of Town Hall in NM. Mayor Bob Gambino himself helped Tom Ruane raise the flag on April 12; it will keep flying for one week. Monday, April 15, during a ceremony starting in Town hall at 12 noon, Mayor Gambino will present the yearly Leonardo da Vinci award for excellence in the arts to world-famous New Milford painter Woldemar Neufeld and to Diane Dubreuil, President of the Housatonic Art League - both awardees also will be celebrated for their dedicated work on behalf of our community. Pantone color specs are: Red = 186; yellow = 116; blue = 287, Flag ratio is 100:161.8, or the 'Perfect Ratio' in honor of Leonardo. The design was derived from the arms of Vinci by Roberto Breschi in 2000. A small illustration of the arms is visible at <www.comune.vinci.fi.it> under 'Museo' The top half of the flag illustrates the Castello dei Conti Guidi (ca. 1000) donated to the Comune di Vinci in 1919 by the Guidi family to house the works of Leonardo. The bottom half recalls the da Vinci family arms. Flag was first flown in New Milford, CT. USA, on 15 April 2001, the 449th anniversary of Leonardo's birthday in 1452, and every year since on the same date.